From Invermoriston on Loch Ness or from Invergarry, you can join the A87 road towards the Isle of Skye. This passes Loch Cluanie, the Five Sisters of Kintail (spectacular mountains) and Shiel Bridge at the head of Loch Duich and then follows the shore of the loch to Kyle of Lochalsh. Photo © Gordon C. Harrison 8 miles before reaching Kyle of Lochalsh on the A87, you will find the picturesque village of Dornie where you will see the famously photogenic Eilean Donan Castle. Originally a stronghold of the Mackenzies of Kintail, it is now the clan castle of the MacRaes and well worth the visit. Click here for full details about the castle. They have a webcam. The Lochalsh Woodland Garden at nearby Balmacara is open daily all year 9am - sunset. It is cared for by The National Trust for Scotland. Click here for details of walks in Kintail and Lochalsh. There is a new signposted trail for walkers and mountain bikers from Drumnadrochit (Loch Ness) to Morvich in Kintail by Loch Duich called The Affric Kintail Way (44 miles). There is a scenic detour from the A87 which you can take at Shiel Bridge (look for the signs to the Skye Ferry). From here you can take the mountain route to Glenelg, which is famous for Bernera Barracks (built after the 1715 Jacobite uprising) and the historic well-preserved Glenelg Brochs. Glenelg is a village on the shores of the Sound of Sleat and has a small ferry which crosses over to Skye. Eagles can often be seen here. 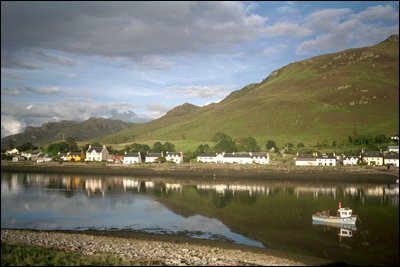 Visit the Loch Duich & Kintail community website. Kyle of Lochalsh is 8 miles along from Eilean Donan Castle. Once a busy ferry port to the Outer Hebrides and Skye, the town is now home to the Skye Bridge which enables you to drive over to Kyleakin on the south-east tip of Skye. A regular train service operates between Kyle of Lochalsh and Inverness via Achnasheen (to the north) on the famously scenic West Highland Line. The Friends of the Kyle Line have a museum and gift shop in the railway station by the pier. Citylink operates 2 bus routes to Kyle of Lochalsh from Inverness (southwards via Loch Ness) and Fort William. Buses cross the Skye Bridge for onward travel across the island of Skye. Stagecoach Buses also operate many local routes. The Skye Ferry is a community-run service operating Easter to September only. Tel: 01599 522273 or 01599 522313. This small ferry goes across the Sound of Sleat between Glenelg and Kylerhea on the isle of Skye in 5 minutes and holds 6 cars plus foot passengers. Kyle Taxi Company offer day tours of Skye & Lochalsh, or Plockton, Lochcarron and Torridon, or even Inverness and Loch Ness. They also have a classic Daimler for wedding hire. Telephone: 01599 534323. Red Moon Cruises offer tailor made holidays for up to 4 people sleeping in 3 cabins (1 double and 2 single). The cruising area covers Skye, Knoydart, the Small Isles, Wester Ross and the coastline north and south of Lochalsh. Based at the pontoons in Kyle of Lochalsh, the Red Moon can also offer luxury lunch or dinner cruises. B&B (with optional dinner) can be arranged on board when the boat is docked at the pontoons in Kyle of Lochalsh. Alternatively, you can sample 'A night at anchor' with a scenic cruise, gourmet dinner and breakfast before heading back to Kyle. Contact Scott and Mary. Tel: 07768 101667. Moira and Nigel Smith operate the Seaprobe Atlantis, which offers panoramic underwater vision. It sails from Kyleakin and Kyle of Lochalsh (the mainland opposite Skye) taking people to explore the incredibly beautiful world beneath the waves, as well as the spectacular scenery above. The boat has a seated outdoor observation deck, a sheltered indoor saloon, toilets and of course the underwater viewing gallery. You will see fish, jellyfish, crabs, seals, seabirds, etc. and possibly otters and porpoises. The extended cruise also shows you the World War II shipwreck, HMS Port Napier, a 500ft long minelayer which sank in 1940, and is now rated one of the best dive experiences in Britain. Cruises operate at least 4 times a day depending on the tides, 7 days a week, from Easter to October. Please book in advance to avoid disappointment. For further details, see their web site or phone 01471 822 716 or use the freephone number 0800 9804846. MV Brightwater is a small charter vessel taking 6 passengers on day or half day cruises to Eilean Donan Castle in Loch Duich, the islands of Raasay and Rona, Loch Nevis (Knoydart) or just sail under the Skye bridge. Departures from the pontoons at Kyle of Lochalsh. Tel: 07768980924. If you drive north from Kyle of Lochalsh, you can see palm trees in the village of Plockton (home to TV's Hamish Macbeth). Calum MacKenzie offers award-winning boat trips April to October. Free if no seals. Tel: 01599 544306. Plockton hosts a sailing regatta in late July/early August every year. There's an excellent swimming pool in the leisure centre. Continue northwards into Wester Ross through splendid scenery such as Applecross and Lochcarron. Renovated schoolhouse just 400 metres from Eilean Donan Castle. 2 minutes walk from local shop, hotel/restaurant, bar. Relaxed and peaceful setting overlooking Loch Duich. Great base for exploring Skye and the West Highlands. Only 8 miles from the Skye Bridge at Kyle of Lochalsh. 4 bedrooms (3 double & 1 twin). TV, hairdryer, tea/coffee facilities, fresh towels and linen. Modern kitchen/dining area with gas hobs, microwave, fridge, etc. Gallery with paintings, cards and gifts plus tearoom. Exclusive use (all 4 bedrooms) from £290 per night (8 people). fresh fruit, yoghurts, cold cheese and ham. Grianan House offers bed and breakfast overlooking Loch Duich at Inverinate. Eilean Donan Castle 5 miles. Contact Janet Ellis. Tel: 01599 511440. The Kyle Hotel is on the Main Street in Kyle of Lochalsh. Tingle Creek Hotel at Erbusaig (between Kyle of Lochalsh and Plockton). Family run hotel with 12 bedrooms, bar and restaurant. Tel: 01599 534430. List of accommodation near Eilean Donan Castle (Dornie area). 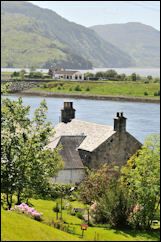 Lochside House (4 bedrooms) in the village of Letterfearn on the shores of Loch Duich, overlooking Eilean Donan Castle. Barracks Cottage in Glenelg sleeps 4+1 in 1 double bedroom, 1 single and 1 twin (single bed & smaller cabin bed). Fully equipped kitchen and living/dining room. Overlooking the Sound of Sleat with views across to Skye. Hirta is a converted former church in Plockton with 1 bedroom. Kintail at Ratagan is a 2-bedroom cottage with loch and mountain views. Loch Duich Cottage overlooks the loch at Inverinate. 3 bedrooms. Red House Dornie - a large lochside house offering 4 star accommodation for up to 12 people. 5 minutes walk from Eilean Donan Castle. Sgurr Uran is a traditional 2-storey stone cottage on the shores of Loch Long, 15 minutes walk from Dornie village centre, and 20 minutes walk from Eilean Donan Castle. Sleeps 4 people in 2 bedrooms. The Lodge - Tigh na Creag - Glenelg offers 4 star accommodation for 2 people. Tigh Tasgaidh in Dornie is only about 500 metres from Eilean Donan Castle. Luxury self catering wing sleeping 4 people with 1 double bedroom, 1 twin bedroom, lounge, kitchen/dining room. B&B is available for 2 people in a separate first floor suite with 1 double bedroom and sitting room. Open March 1st to November 30th. Contact Louise Canning. Tel: 01599 555242. The Ratagan Youth Hostel (SYHA) at Glenshiel has accommodation for 44 people, and views of the Five Sisters of Kintail. 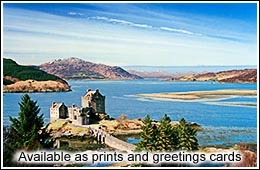 It is 8 miles from Eilean Donan Castle and 18 miles from Kyle of Lochalsh. Open March - October. Tel: 01599 511243.